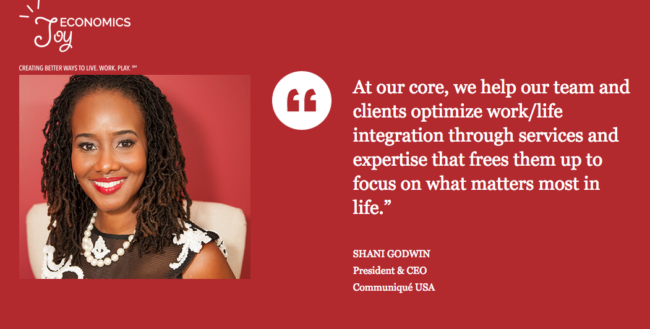 Shani Godwin has grown her company, Communiqué USA, by 300 percent. How? By under-working her employees. 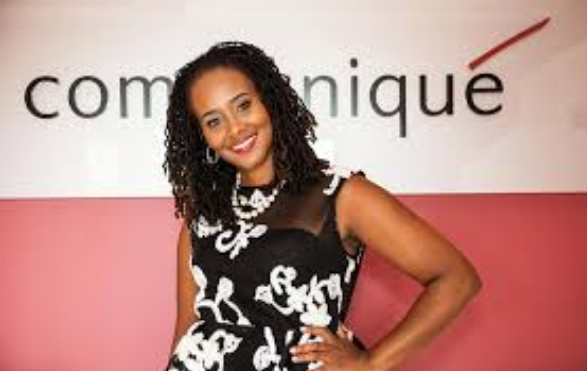 As CEO of Communiqué, the marketing communications firm based in Atlanta, Godwin emphasizes the importance of work-life balance — giving her employees flexible schedules, necessary breaks throughout the day, recess time, and 35-hour work weeks. “We created a platform called Joy Economics. It embodies and characterizes our company’s ‘live, work, play‘ philosophy,” Godwin told Fairygodboss. In order to de-stress employees and keep them happy in the workplace, Godwin does an annual “Play Day,” where she takes her 19 employees out for a day of fun, like to an Atlanta Braves game in the middle of the workday. Godwin also does an annual company retreat each fall, where Communiqué employees are taken off-site and away from clients to celebrate their accomplishments at the company. The 16-year-old marketing communications firm specializes in providing marketing staffing support to major companies. They place contractor talent, such as project managers, graphic designers, and writers, on-site in under-staffed marketing departments to take the stress load off of the marketing team. Godwin started the company when she was 27-years-old, working in corporate America, wanting to start a family with her then-husband but unsure how to raise children the way she wanted to while only being offered two-weeks vacation at her job. Her “live, work, play” philosophy initially came out of her own personal lifestyle preferences. Upon creating the company, Godwin realized she had to de-tox her new employees from their previous work environments. “Our employees are not allowed to engage in email with each other or with clients after 7 PM and on weekends,” Godwin explained. Godwin’s emphasis on taking breaks has proven to be successful, as she not only grew her company tremendously but has also increased payroll expenses by 500 percent since implementing her Joy Economics policies. “I’ve always been very passionate in the belief that we have the ability to set our lives up in the way that we want them to look for us,” Godwin explained.